Average Continuous Composite CMY Declared Cartridge Yield up to 6,000 standard pages in accordance with ISO/IEC 19798. Going green has never been easier. 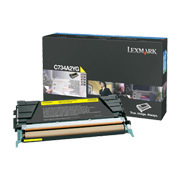 Recycle all your used Lexmark supplies by letting us take care of the details. It's simple, smart and always free. Get the most out of your Lexmark Technology by using genuine Lexmark supplies - value, quality and environmental responsibility you can count on. Up to 6,000 standard pages in accordance with ISO/IEC 19798.